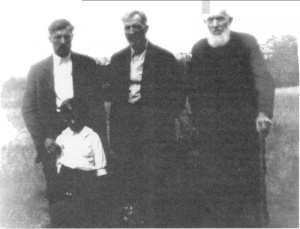 Four generation picture, 1936. Front: Jim Isaac (1931); Back (l-r): Daniel Isaac (1905-1976), Abram L. Isaac (1881-1962), and Abraham P. Isaac (1852-1938). Preservings photo. Abraham P. Isaac: pioneer educator and minister, born on 31 December 1852 in Schönau, Molotschna Colony, Russia to Johann W. (1809-1864) and Anna S. (Plett) Isaac (1813-1887). He was the seventh of eight children. He was baptized on 21 October 1873 in the Kleine Gemeinde. Abraham married Margaretha Loewen (1855-1930) on 26 December 1873 in Blumenhof, Borosenko Colony, Russia. The couple had 9 children, one of whom died young. The family emigrated from Russia on 17 July 1874, arriving in Manitoba on 2 August. Abraham died on 9 March 1938 in Kleefeld, Manitoba, Canada. Abraham grew up in the village of Schönau, Molotschna Colony, Russia. Although Abraham was only 12 years old when his father died, he managed to complete his schooling before going to work for his uncle in Kleefeld and then for his cousin in Lindenau. When his cousin’s family moved to Grünfeld in the Borosenko Colony, Abraham also moved. He later worked for a family in Heuboden, near Grünfeld. He felt humbled when the church leadership asked him to be the village school teacher after working as a simple farm hand. He taught school for four and a half years in Russia, working extremely diligently at this task. In Canada after 1874, Abraham P. Isaac always maintained an interest in education, even though he no longer served as a teacher. In 1879, he attended a teachers’ conference in the village of Chortitz on the East Reserve. He also had discussions with Henry H. Ewert (1855-1934) of Gretna, who served as a school inspector in southern Manitoba for several years. After a number of difficult pioneering years of farming at Schönau, he became quite successful and eventually owned all of section 30-6-5E except for the northwest quarter. He is remembered for his determination and impressive improvements he made in his farming operation. In January 1882 Abraham P. Isaac along with Peter P. Toews (1841-1922) and Martin Penner (1849-1928) were ordained as ministers in the newly founded Church of God in Christ, Mennonite (Holdeman). He served this church faithfully for 53 years, until his health began to fail in 1935. Abraham P. Isaac contributed an article to the 60 Jährige Gedenkfeier, the history book commemorating the 60th anniversary of the Mennonites in Manitoba in 1934. His writings were also quoted at length in the 75 Jährige Gedenkfeier by Gerhard F. Wiebe in 1959. His memoirs written in 1930 have also been published in a family history and in Delbert F. Plett’s Pioneers and Pilgrims (pp. 171-177). Abraham P. Isaac was an adaptable, dedicated, largely self-taught person who worked hard to overcome his limitations and to use his skills however he could. Throughout the many changes in his life, he managed to find ways to adjust to his circumstances. GRANDMA (The Genealogical Registry and Database of Mennonite Ancestry) Database, 5.03 ed. Fresno, CA: California Mennonite Historical Society, 2007: #2679. Penner, Roger and Dawn. "Abraham P. Isaac (1852-1938)." Preservings No. 12 (June 1998): 69-73. Huebert, Susan. "Isaac, Abraham P. (1852-1938)." Global Anabaptist Mennonite Encyclopedia Online. 2007. Web. 23 Apr 2019. http://gameo.org/index.php?title=Isaac,_Abraham_P._(1852-1938)&oldid=95379. Huebert, Susan. (2007). Isaac, Abraham P. (1852-1938). Global Anabaptist Mennonite Encyclopedia Online. Retrieved 23 April 2019, from http://gameo.org/index.php?title=Isaac,_Abraham_P._(1852-1938)&oldid=95379.